Not long after we saw press images of the Samsung Galaxy Tab S 10.5, it’s now time for us to take a look at the Galaxy Tab S 8.4. As we assumed yesterday, the Tab S 8.4 resembles the Tab S 10.5 - although, of course, it’s smaller, having an 8.4-inch screen instead of a 10.5-inch one. Just like the display of the Galaxy Tab S 10.5, the screen of the Tab S 8.4 should be an AMOLED one with 1,600 x 2,560 pixels (offering a pretty high 359 ppi density). The new tablet should further feature Android 4.4 KitKat, an octa-core Exynos 5420 chipset, 3GB of RAM, and microSD card support. We’re not sure what those two circles spotted on the back represent, but we’ll probably find out soon. The Tab S 8.4 will have two versions: one with LTE (SM-T705), and a Wi-Fi-only one (SM-T700). Super thin, super slim and super sharp. I dont know if it is gonna be great being Amoled. Yes all it's black and Colors are vivid and awesome, but it is very imperfect, especially Grays. The OC in me wants to throw away my S5 and Note 3 because of the screen's inconsistencies especially in the dark. I can't imagine if it's on a larger scale. Its still abit underpowered, an extra 500Ghz raise in Cpu and 4Gb Ram would be great. why the 4Gb Ram? you don't need that extra Ram. what app needs 2.5 gb ram to run? They are A15, not regular A9. While more hungry, they give more power. 500Ghz? I sure want that! I actually like this design. Nice tablet. It has less curves than any of their previous ones. They make so many models of things, I would like to see a version without hardware home buttons being used. Then this would be incredibly sweet to my tastes. I love hardware buttons, they don't use screen real estate. Yes, they may lag by milliseconds, but never noticeably. This maybe a release day purchase, if I don't work. 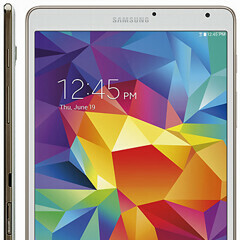 Without the hardware home button I will not be interested by this beautifull (hardware, software, design) tablet. AMAZING. I want this. Man the AMOLED on my GS5 is FANTASTIC .. I would imagine this on a tablet .. I also agree too as well. I disagree with the people that disagree!! Best 8" Android tab of 2014. Can't wait to get my hands on this. Same to, been waiting years for a Amoled screen. Don't like SLCD, Amoled full blown, saturated, richer, superb viewing . 8inch superb, not to big not to small, and finally with full straight A15 Cpus, with no octocore 4x4. It would be nice to know the battery size though and also the overall dimensions as the bezels seem so small... Very nice. Amoled display no thanks. Burn-in on the galaxy tab 7.7 was horrible. I would rather get the tab pro 8.4 which is already released.